First of all to be able to use the library you need to let the Google Maps API know that you want to use it. This is done by adding an extra parameter to the querystring when including the Maps API on the web page. The spherical namespace includes functions for calculating angles, distances and areas from latitudes and longitudes. These are the functions that we will examine in this article. The other namespace, encoding, contains functions for encoding and decoding paths for polylines and polygons. They’re useful when you have big sets of data for displaying polylines or polygons that you need to optimize. I will not describe this namespace further here, maybe it’s a subject for a future article. Note: The library doesn’t consist of any classes but only have static functions. When calculating distances and areas you need to take the fact that the earth is round into consideration (hence the name spherical). Since a map is flat a straight line on it is in fact an arc. Take a look at the map below. 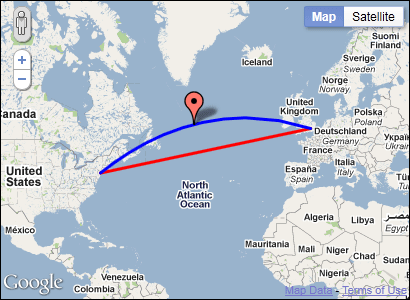 The shortest route between New York and London will look like an arc on a flat map (the blue line in the image below). A straight line between two point on a map is in fact an arc. Therefor when calculating distances and areas you need to use some pretty advanced mathematics to do it. Fortunately with the Geometry Library it’s dead simple. Calculating the distance between two points is really easy with the help of the Geometry library. All you have to do is to call the computeDistanceBetween() function and pass it two LatLng objects. The function returns the distance in meters. In this case it says that it’s 5 576 673 meters between NYC and London. If you also want to know the heading between two points you can use the computeHeading() function. It also takes two LatLng objects and determines the heading from the first to the second. The heading is returned in degrees from the true north (counts clockwise from 0). The heading from NYC to London is 51.2145583127633 degrees. To calculate the size of an area there’s the computeArea() function. Unlike the two previous functions it takes an array of LatLng objects as a parameter. The LatLng’s in this array represents a polygon and it must be closed, meaning that it will automatically close the polygon by connection the first and the last LatLng. Note: You can also pass a MVCArray as a parameter. It’s basically a regular array but is API specific and has a few other advantages. There are a few additional functions apart from the ones that calculates distances and areas. If for example, you know the starting point, the distance and the heading. You can get the end location by using the computeOffset() function. It takes the starting point, the distance and the heading as parameters and returns a LatLng object. If we take the values from the previous examples, the location of NYC, the distance to London and the heading towards London and use them as input. With the computeOffset() function we can get the end location if we know the starting point, the heading and the distance. Another useful function is interpolate() which determines a point between two locations based on a fraction between 0 and 1. The fraction represents how far between two locations a point is. So for example 0.5 is a point right in the middle between the start- and end location. This code will return a position right between NYC and London. By using interpolate between NYC and London with the fraction 0.5 we get the position right in the middle of those. Calculating areas and distances on geo data can be tricky, but with the help of the Geometry Library it’s really simple. I hope this article has shed some light on how you can use it in your own map solution. You have made one mistake. rca: Good catch! Thanks for letting me know. I’ve updated the article so that it’s now correct! Selvi: There’s no other way of computing headings in v 3.2 that I’m aware of. But you could of course do the calculations yourself. Is there any php library with functions like google.maps.geometry.spherical.computeOffset ? Post was of great help. I trying to draw the arc between 2 points, say a flight plan between nyc and london (the blue line above). How would you do it ? I could use the polyline encoding utility provided by Google and manually to try to get an arc. Is there a simpler method ? hi, i have one question, can i in some way, check if an address belongs into a quadrant defined by a geometric using gmaps? How can I get the midpoint on red line (straight line between NYC & London ) ? i try to change the parametre “sensor” by true or false only but i got not the distance. Does anybody can help me to make 3 point great circle pat in google maps! Very nice article , helped me alot, thank you Gabriel! No problems! Thanks for the feedback! my bad forgot to include lib…..can u tell me what sensor do if i gave true or false what happen ?